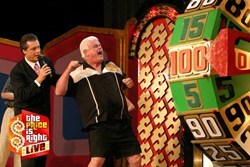 Branson Ticket & Travel sends an invite to See The Price is Right Live in Branson, Missouri. I truly had a wondeful experience on The Price is Right! I was shocked to be called and they pronounced my name correctly! Plinko is my favorite game and I was so happy to get a chance to play. I would certainly do it all over again! Branson Ticket & Travel - The Welk Resort Branson continues its legacy of providing legendary family entertainment by announcing the 2013 season schedule of “The Price Is Right, Live!,” the on-stage, audience-interactive version of the longest running game show in TV history. The show returns to The Welk Resort Theatre for its second season. To purchase tickets online, click here or call 1-800-432-4202. Since 2006, “The Price is Right, Live!” has packed-in audiences around the country, including runs in Atlantic City and a permanent show in Las Vegas, providing all of the games, excitement and fun of “The Price is Right” television show. Starting March 2013, Branson audiences can be a part of the live stage show: more than 50 audience members have a chance to win prizes like cash, appliances and even a new car, by playing the same games that made the television show such a success. To request more information or a free Branson Show Schedule and Vacation Planner, click here. From March through November The Price Is Right Live will thrill audiences and provide Branson guests a unique opportunity to experience all of the fun that has made The Price Is Right the number one game show of all time. The Price Is Right Live! schedule covers March through November. Performance times are 2 and 8 p.m.